If you're searching for a child psychologist in Cary, NC, visit Wynns Family Psychology – Psychological Solutions for Children, Adolescents and Families. Weekday, evening, and weekend appointments available! **If your call is directed to voicemail, please leave your confidential message, and we'll return your call the same business day. Our child and family psychology practice is located at the intersection of Cary Parkway and High House Road in west Cary. We are in the northwest corner, behind First Citizen's Bank, Bruegger's Bagels, and Mellow Mushroom. The easiest way to access 130 Preston Executive Drive is from NW Cary Parkway. Turn onto Preston Executive Dr when you see the Marquis at Preston residential community on the opposite side of Cary Pkwy (note the road reads as Grove Club Lane on the Marquis side but is Preston Executive Dr on the medical / shopping center side, where you will be entering). Go to building 130, and take the elevator to Office Suite 202 on the second floor. You can check in at the reception window or wait for your doctor in the waiting area until your scheduled appointment. Call (919) 467-7777 or email Info@WynnsFamilyPsychology.com for more information and to schedule an appointment. You can also text "NEW CLIENT" to (919) 805-0182 with your name and phone number, and we'll call you back the same business day. Most new clients are scheduled for their first full appointment at the Cary, NC office location within one to two weeks of calling. If you're searching for a child psychologist in Raleigh, NC, now you can visit Wynns Family Psychology – Psychological Solutions for Children, Adolescents and Families at our North Raleigh location. Our new child therapy and testing office is just off of Interstate 540 in Raleigh, and convenient to the Wake Forest area. So now you can choose from either our Cary NC office or our North Raleigh location! 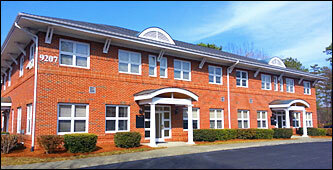 Our child and family psychology practice is located on Baileywick Rd in Raleigh, just off of Interstate 540. Take I-540 to Exit 11 and drive south on Six Forks Rd. Turn right onto Lead Mine Rd and then another right onto Baileywick Rd / Harvest Oaks Dr. Our office is on the left, inside the Oakmark Office Center, across the road from the YMCA. Go to building 9207, and take the steps to Office Suite 203 on the second floor. (Please note there is no elevator in this building.) Please have a seat until your doctor meets you in the waiting area for your your scheduled appointment. Call (919) 977-5120 or email Info@WynnsFamilyPsychology.com for more information and to schedule an appointment. You can also text "NEW CLIENT" to (919) 805-0182 with your name and phone number, and we'll call you back the same business day. Most new clients are scheduled for their first full appointment at the Raleigh, NC office location within one to two weeks of calling.